A friend of mine used to work for a football (sports) marketing company run by Sepp's cousin in Zug. So he was able to look on the 'internal' phonebook and found this. An American friend of mine was a nanny for a family in Zurich. They lived in the exclusive Zurichberg neighbourhood perched over (looking down on) the city of Zurich and the lake. One morning her employers told her that their BMW had developed a problem and that while they were out they a BMW mechanic would come round and collect the car, so all she had to do was give him the keys. The car's alarm kept on going off every five minutes causing quite a din. After a while the doorbell rang. She answered and a man spoke to her in German. She couldn't speak German so went to get the keys. She tried giving them to him. But he looked confused and upset and said something else in German. He pointed to the car and so she again tried to give him the keys. He refused and spoke more German, so she said in her Texan accent something like, yes I know it's noisy, you are supposed fix the car or take the car away, here's the keys. He then spoke English and said something like, I not a mechanic, I'm a neighbour and your car is making a terrible noise. My name's Blatter. Expecting her to know who he was. Unfortunately it wasn't till later that her employer told her who he was. Hilarious, I'd love to have been a fly on the wall. Blatter's speech the other day complaining that the journalists were not showing respect and reminding them that they are in FIFA's house really stank. The old adage that respect has to be earnt is obviously lost on this guy. Making it seem like a cathedral. The guy's power mad. He's already claimed he won't seek re-election in 4 years time. Sounds like an empty promise of an African dictator. I saw a cool tee-shirt on Sunday in Zurich, 'Love Football. Hate FIFA." I know a couple of people that work for FIFA and they seem to be perfectly respectable and honest folk. FIFA employs from all over the globe and if they clear this present mess up, I see no reason why they shouldn't continue in the same vein. Even if bribery is seemingly rife within the top levels of the directors, it hardly proves that the whole system is rotten. I have no idea what you do for a living but if your boss or fellow worker was taking bribes, why would they necessarily feel the urge to share their gains with you? By it's very nature, it's a very personal and discrete matter. to say the staff at fifa don't know is a bit of a joke to be honest, the money is coming from somewhere, that leaves a trail, so mr blatter what did you do with that 40k in cash you took with you??? at the very least everyone in account / finance would notice. I have no doubt that there are perfectly honest staff at fifa, but the organisation as a whole is bad, the only way to cure it is to get rid of it and start afresh with clear rules, join the new 'fifa' and you will get the world cup when its your turn, no messing with bids, no need for back handers etc if you don't have the infrastructure to hold the event then it goes to the next on the list until you do. It was NOT Mr Blatter, but the delegates who voted for Qatar. Except that the banking sector is independently regulated, and the legislation by which it is bound would have found Mr Blatter guilty of failing to disclose information, which would have led to him being removed from his position, penalised financially, and potentially a custodial sentence of up to 5 years. But then, of course, Mr Blatter wrote the rules, and appointed his mates to the committee that enforces them, so nothing corrupt going on there. I hardly think that each FIFA employee knows exactly what goes on behind closed doors any more than at any other large organization. To be frank, when big important deals are being done in the real world, ethics and morality are the first victims as personal enrichment and egos enter the fray. What's going on at FIFA transcends into insignificant if you start looking at what multinationals do for oil drilling rights or at what lengths arms manufacturers go to to get their products selected. Money doesn't wash white or clean, but it keeps the wheels of industry well oiled and turning, ethics committees notwithstanding. It would be naïve to ignore the realities of greed that are an every day fact. These organisations are inherently Teflon-coated as they fall under almost no juristiction, and govern perfect products...i.e. passionate spectators will not stop watching football just because of some scandal in a far-away country. Look at cycling..people still tune in to the tour de France despite its very dirty past few years. Money causes the corruption to become rife, and it just may well be money that will reduce it. The only people with influence are the major sponsors, who all seem to be rattled by what's going on. Coca-Cola, Adidas, etc are all not happy. If they stop the music, quite a few people, including Sepp, won't have a chair. I also agree with Assassin...I know a few FIFA grunts who work damn hard and honestly for their money. Gronona the Financial Secretary just started his presentation slating England. Saying it's always England who attack the FIFA family. He asked England to leave the family alone. Maybe a hint for the FA to leave FIFA. I also agree with Assassin -- I know very honest and reputable people who work for FIFA. Holding them morally culpable for Blatter's actions is just as strange as blaming all Serbians for the acts of Mladic. I saw today that the German football association finally came out with a mild rebuke of FIFA and the suggestion that the 2022 Qatar bid be investigated. Then Platini gave a very milquetoast statement on UEFA's behalf. All of this on the heels of Warner chickening out and backing Blatter and Lisle Austin (acting CONCACAF president and Warner's pawn) attempting to fire Blazer for whistle-blowing outside of CONCACAF -- this has all been a very strange set of gang-land style power plays. I'm exaggerating, obviously, but it's all been such a public display of corruption. It seems to me that the most likely result of this is Qatar losing the Cup - probably sometime over the next year. A lot - if the FA aren't in FIFA, then they cannot play any matches outside of England, i.e. no matches against FIFA member (which includes just about everyone). As an aside, this whole voting Blatter in again is a complete joke - I mean who's he competing against? Why bother wasting the time if no one is going to put up a real fight for the position. 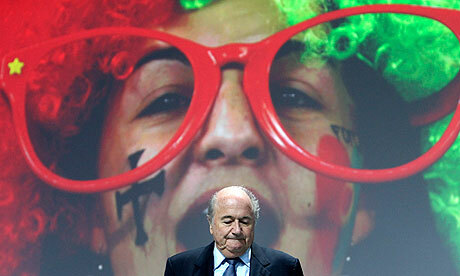 Most dictatorships don't bother wasting time with the lip-service FIFA and Blatter have given vis-a-vis "re-election". Well the FA got a good shoeing for suggesting the election be postponed. Grondona caused controversy in 2003 when, in response to a journalist's question about referee standards in Argentina, he said: "I do not believe a Jew can ever be a referee at this level. It's hard work and, you know, Jews don't like hard work." I know a couple of people that work for FIFA and they seem to be perfectly respectable and honest folk. I also agree with Assassin -- I know very honest and reputable people who work for FIFA. There sure are lots of completely innocent and good people working there. But as we say in German: "A fish starts to stink from the head": If anyone works in a top level position or even anywhere near the top execs, say the secretary scheduling the meetings, I have a hard time to believe they are innocent. Everyone from the IT guy fixing laptops to the hundreds of completely normal office staff does most likely not get Million CHF bribes. But some do and I am sure there are many in there who are aware of it and don't report their bosses to the police. I'm watching the congress live on the FIFA website. The chairman of the Internal Audit Committee is Italian, so that's reassuring. The executive committee of 24 voted. He has announced that for future World Cup selections, all 207 countries will be able to vote from a short list chosen by the executive committee. Will that make any difference? And the short list for 2026 is .... Oh, we only seem to have one nomination! Adidas not happy ???? They for times have profited from Mr Blatter, who gave them preference whenever having the opportunity to do so. How does opening up the World Cup bidding process to 208 voters from 24 help the situation? Surely that just means there are more people who may be susceptible to bribery? Also, those in positions to control bloc votes become even more desirable running mates. Jack Warner's 3 votes (out of 24) gave him control over 12.5%; under the new system he would have 35/208 and therefore 16.8% - thus making him even more powerful. FIFA is supposed to be in a "self serving . . . position" but somehow it is everyone else that gets screwed!